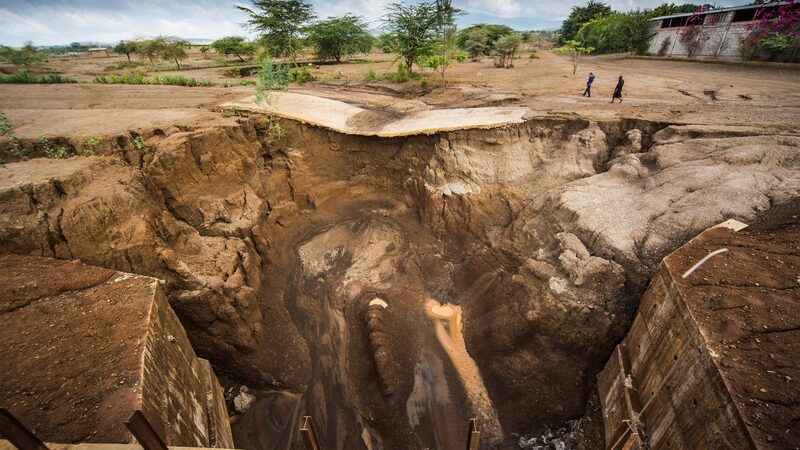 Lemuta Naisikie Lazier stands within an 8-metre gully that separates the village of Landi Kenya in half. The upper area has the other community leaders standing atop the remains of the bridge which is about to collapse. Chief Siputek inspects what's left of the topsoil on the fringes of their land. 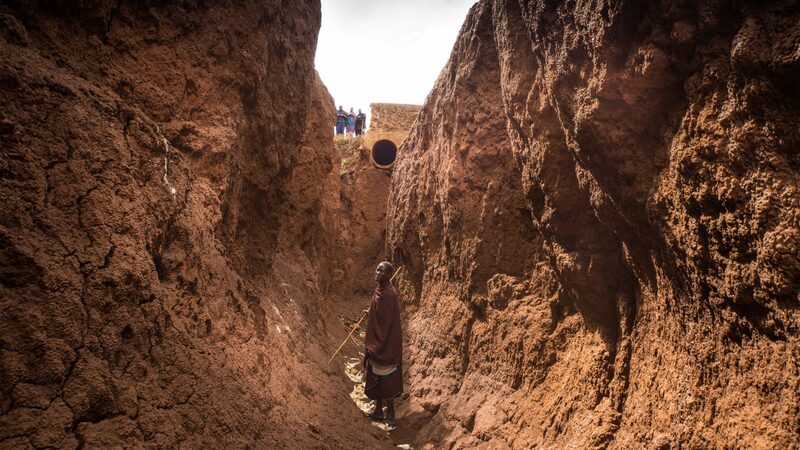 A seven year-old boy and his brother tend to the family goats adjacent to a 12 metre gulley. Behind this site is a corrugated iron Chapel, a place of prayer in times of crisis. 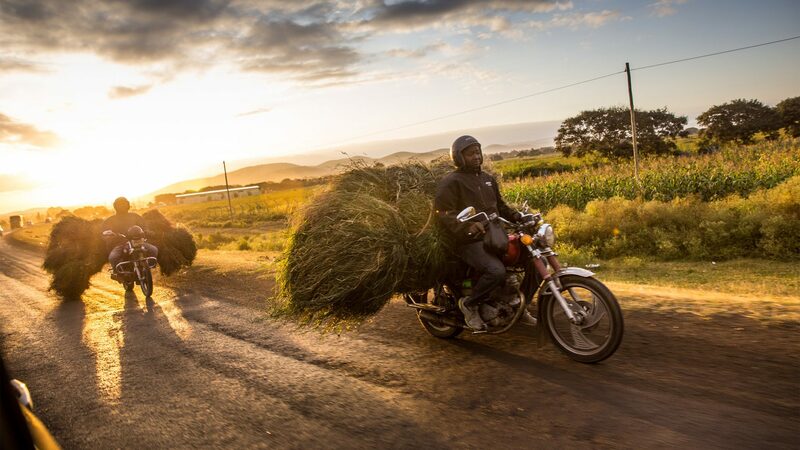 Speeding along in the Evening sunlight - The motorcycle is used to carry all manner of things in Africa. Exceptionally resourceful. 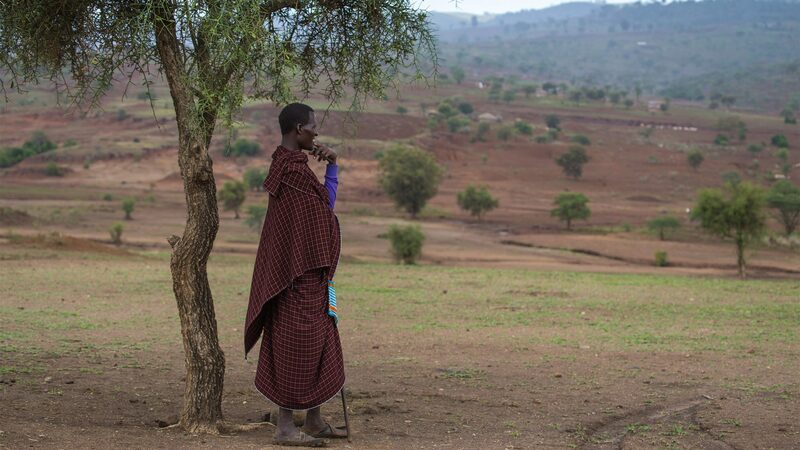 This photograph shows a Maasai pastoralist standing for a portrait in the early afternoon – just as the daily rains begin to fall around 3pm. 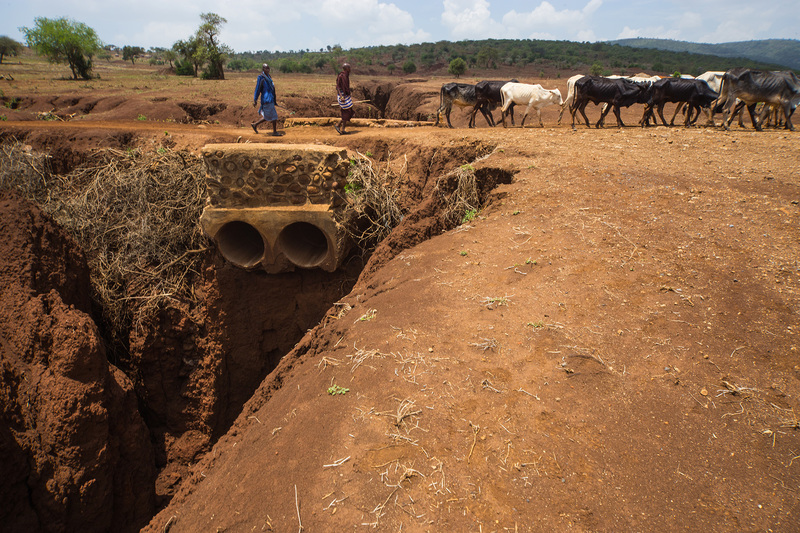 He works with his cattle in the fields behind him, which show deep trenches falling away from the land caused by soil erosion. ‘Five years has shown extreme changes’ he informs me sadly. Another Maasai pastoralist standing for a portrait. His name Lele Lazier, and unusually for a Maasai he has a good command of English. He shows deep conviction for the troubling situation that has unfolded in recent history. Where gullies join, flowing storm water creates deep incisions in the landscape. This one is 8 metres deep. 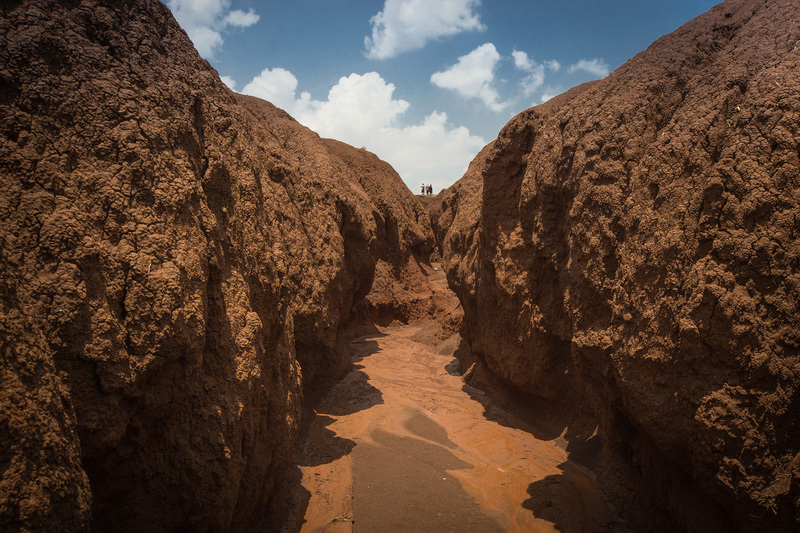 Gullies dissect the landscape making it difficult for people to walk between communities and move livestock to new ground. Fragile crossing points become dangerous. In a desperate attempt to stop the destruction of the bridge, locals have tried to stabilize this 8 metre deep gully with chopped branches. 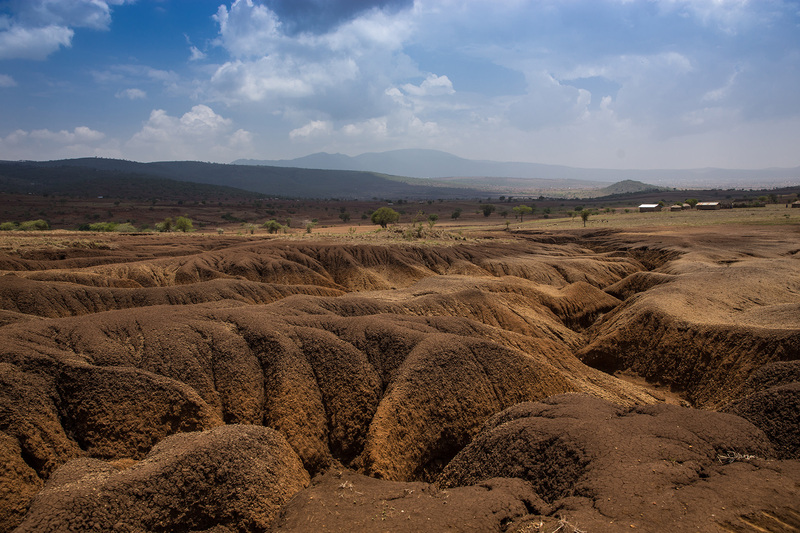 Soils in the region are inherently unstable and, once vegetation cover is lost, rainwater quickly washes away the topsoil through sheet-erosion. 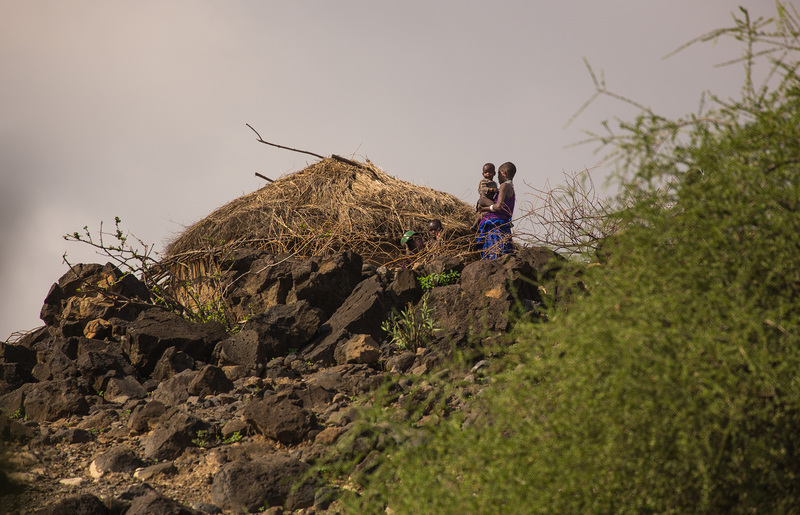 This couple live within a traditional Maasai enclosure. They have lived here all thier lives, and now nearly 70 years later, they talk of the massive change in the landscape they have witnessed. 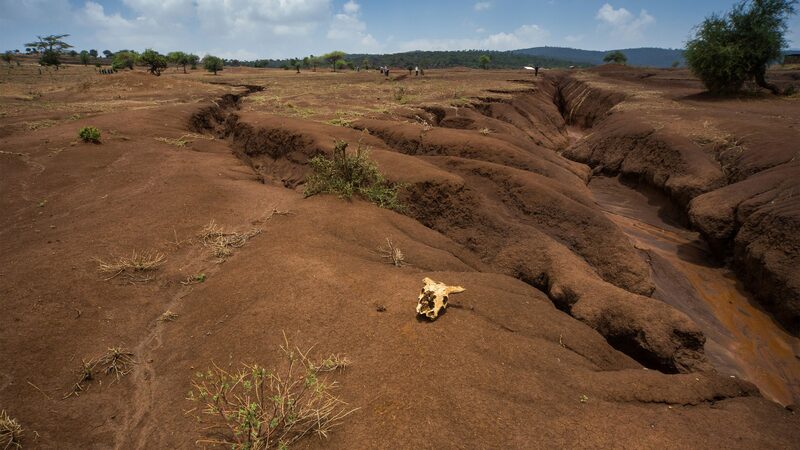 Trampling by increasing cattle along trackways impacts on soil vulnerability. This exposes the soil to damage by rainfall impact. It flows more readily over damaged soils and then gullies form. During our interviews with the stakeholders, we were intrigued to hear it said many times – “that it is a wife’s job to build a house”. This photograph shows the claim as proof. I watched as she carefully daubs the exterior, whilst the husband made an endless succession of phone calls on the ubiquitous mobile. 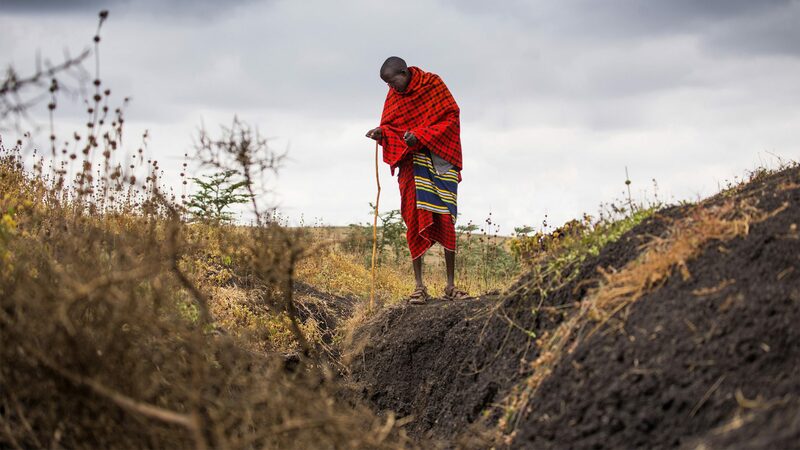 Conservation agriculture may be part of a solution to the soil erosion challenge but for many communities this will require a step change in land management practice and may question traditions that go back many generations. 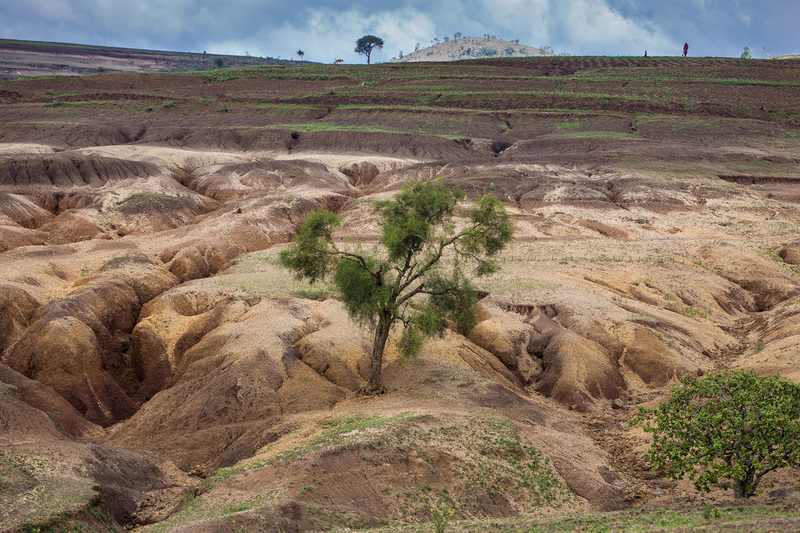 Soil erosion is a complex, global challenge. 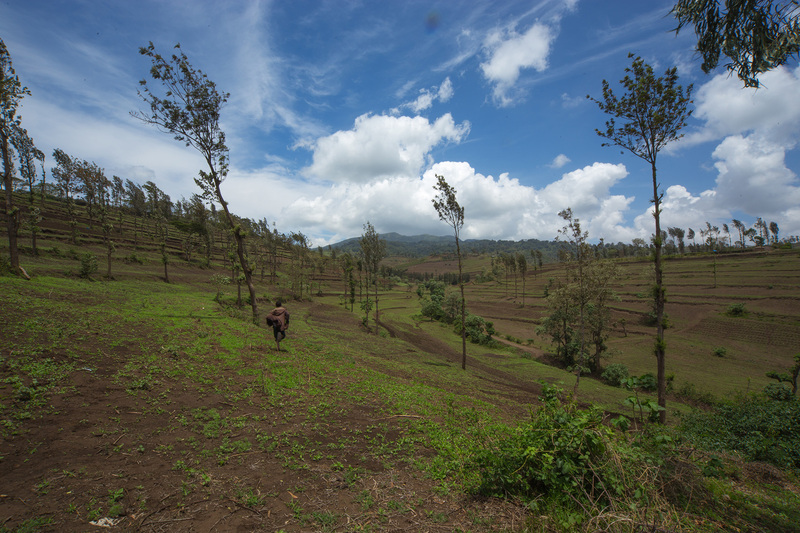 Conservation agriculture is not without its own issues. Here, collapse of historic terraces from the colonial period has contributed to “bad land” formation. 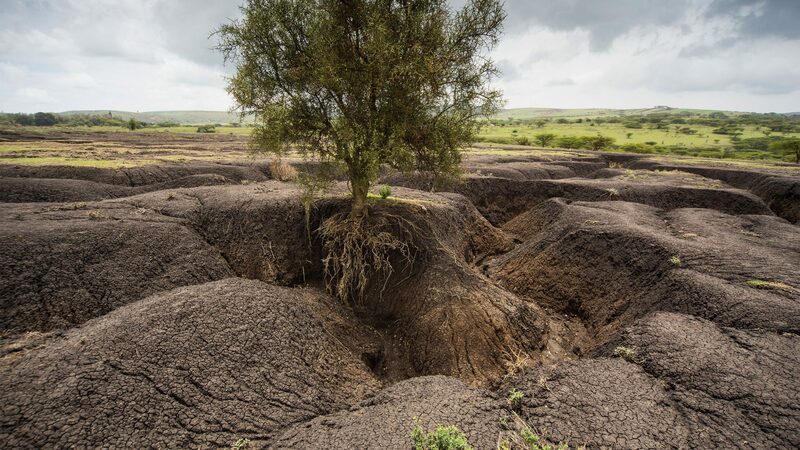 The global threats of climate change and population growth are key catalysts of the soil erosion challenge that is pushing these East African landscapes towards a tipping point. 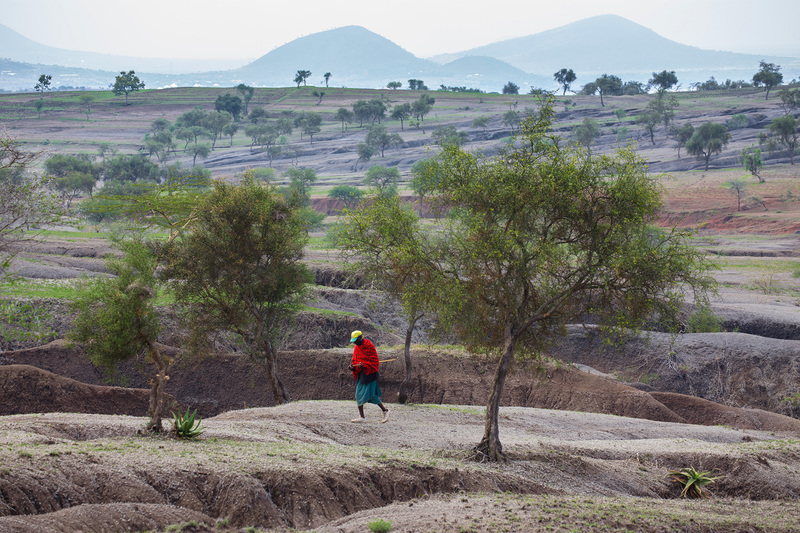 Going beyond it could isolate communities from the resources they rely on. 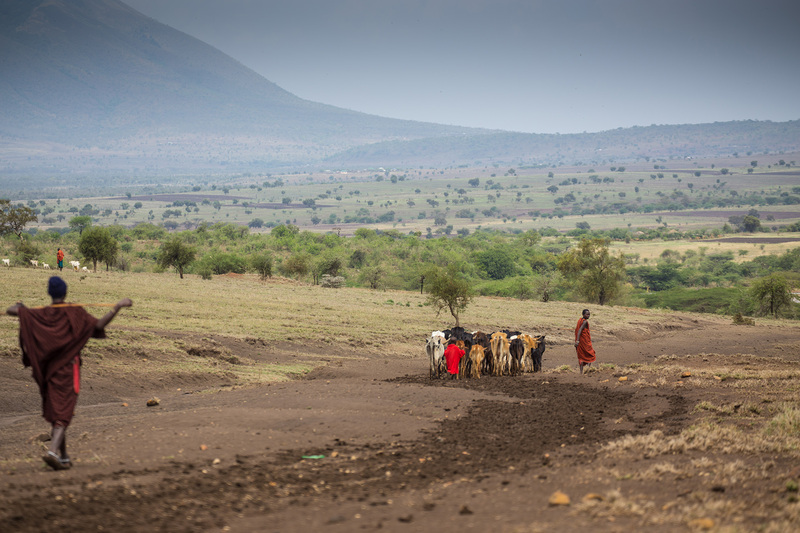 A lone Maasai having to walk across the broken "Bad Lands", increasing his journey time dramatically while navigating the treacherous deep gullies that can swallow you whole in one gulp. The eroding and gullied landscape increases the danger of flooding downstream, posing a major threat to roads, infrastructure and communities. Here the old road has collapsed completely, necessitating the build of an expensive and resource-hungry replacement close by. Something these communities can ill-afford to pay when the funds could be channelled into more productive causes. 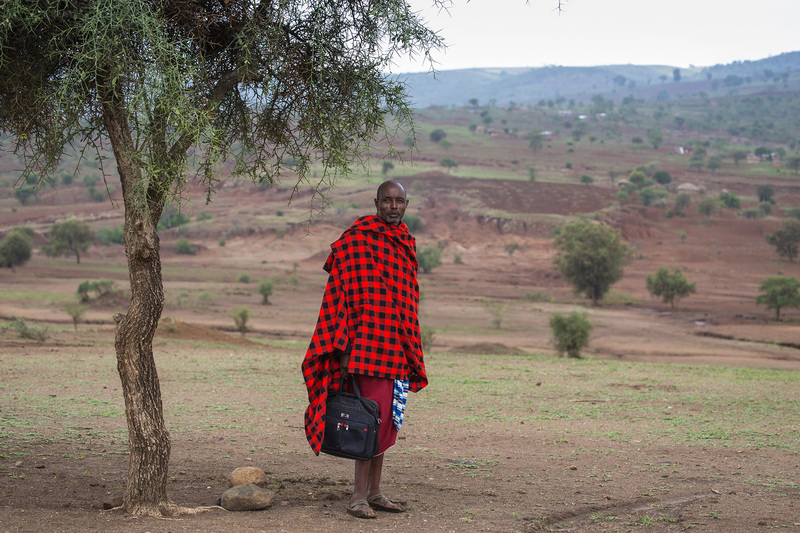 This photograph shows a Maasai pastoralist standing for a portrait with his briefcase following our interview. 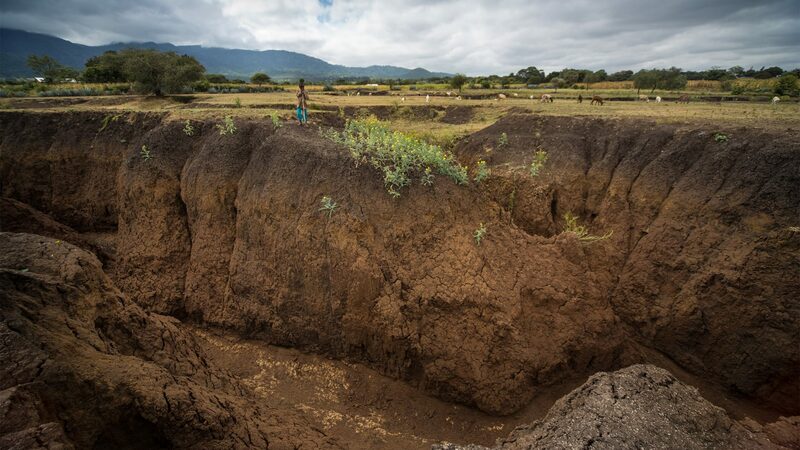 He works with his cattle in the fields behind him, which show deep trenches falling away from the land caused by soil erosion. ‘Five years has shown extreme changes’ he informs me sadly. 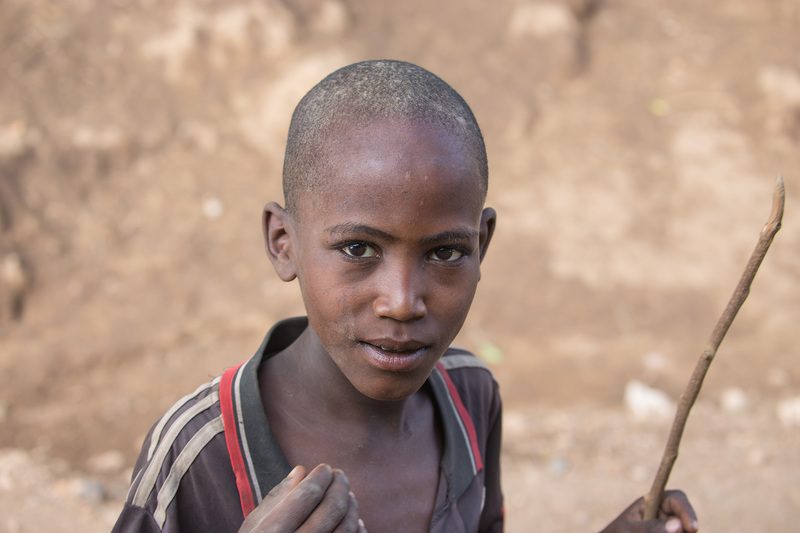 A beautiful Maasai boy, about 10 years old. They hold sticks for managing the cattle that they’ve been sent to herd all day. Instead of the traditional clothing, which is expensive, considering it is not mass-produced, they’ll often wear the T-shirts of their favourite football teams, or other sporting clothes. But they cannot wear red until they are older. 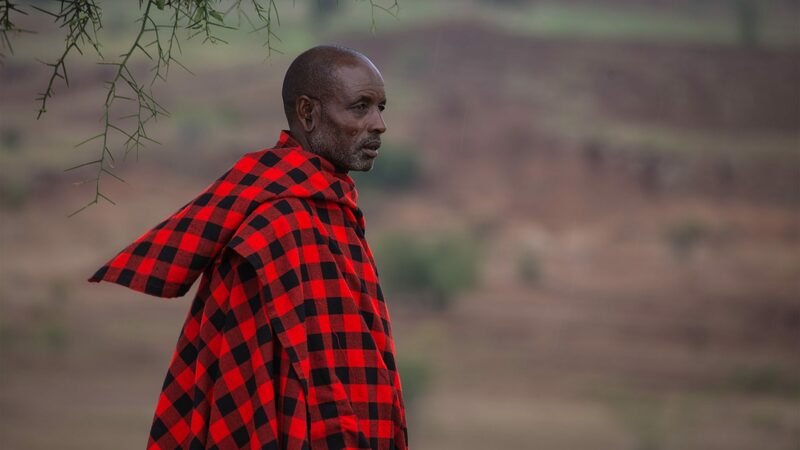 RED is the most important colour for the Maasai people. It represents blood, and it is considered important for Maasai warriors to wear it as a way to protect themselves against wild animals. RED is considered a sacred colour. 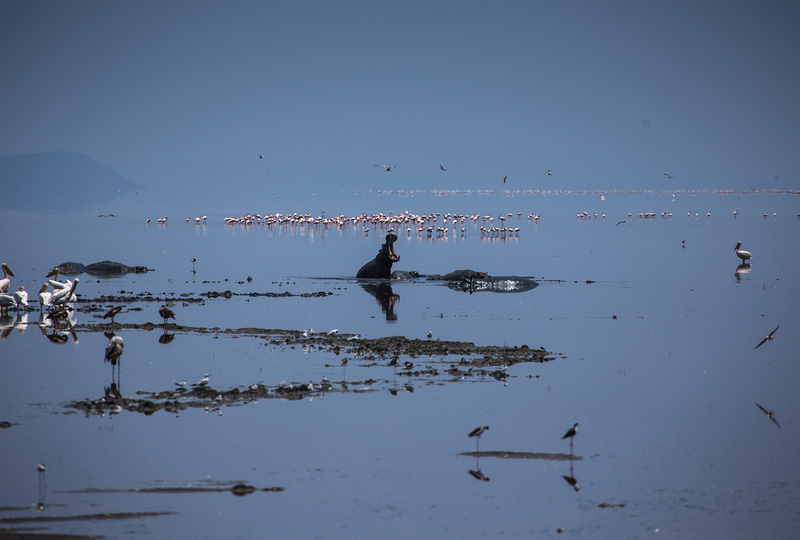 Lake Manyara National Park is a hotspot for biodiversity as it supports over 400 species of birds, numerous big land mammals and other aquatic fauna. Furthermore, this fragile ecosystem attracts more than 150000 tourists every year from all over the world, creating livelihoods for many local people. However, increased siltation and pollution is threatening the preservation of this UNESCO Man and Biosphere site. 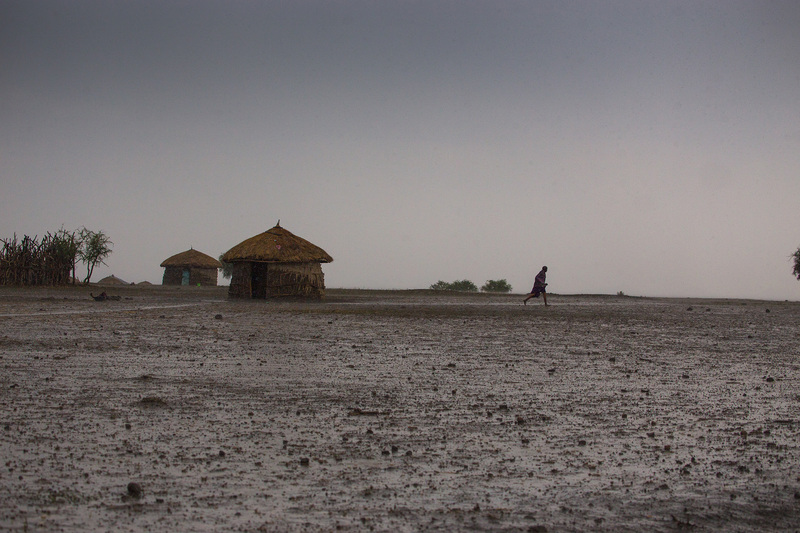 On the fringes of a dried-up lake, We encountered these four boys who were herding cattle. Even though they were young, In some families, these boys will take responsibility for all of the families’ precious livestock. It is said that once they take these responsibilities, they must be mindful of the perils of them. 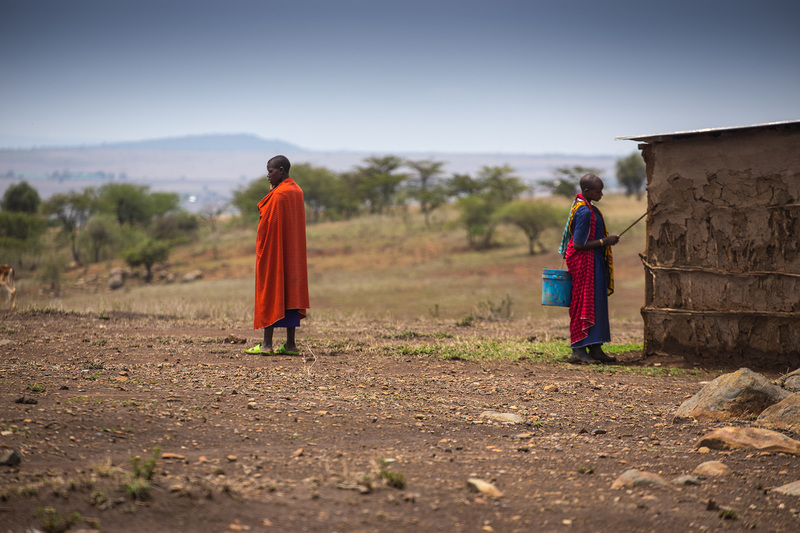 Wearing red and carrying sticks certainly help to ease the mind – as the Maasai believe it discourages lions. 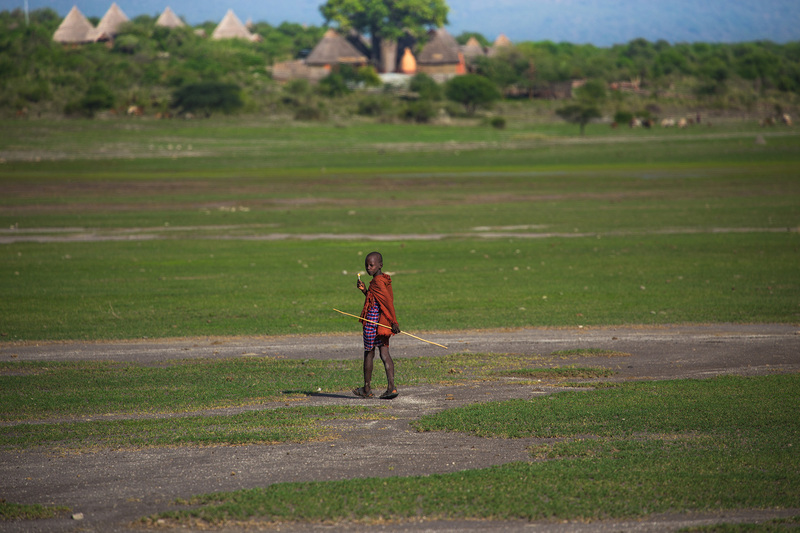 In the huge expanse of this open land, a dried-up lake basin, these children must feel vunerable. This very young boy couldn’t have been more than four years old. 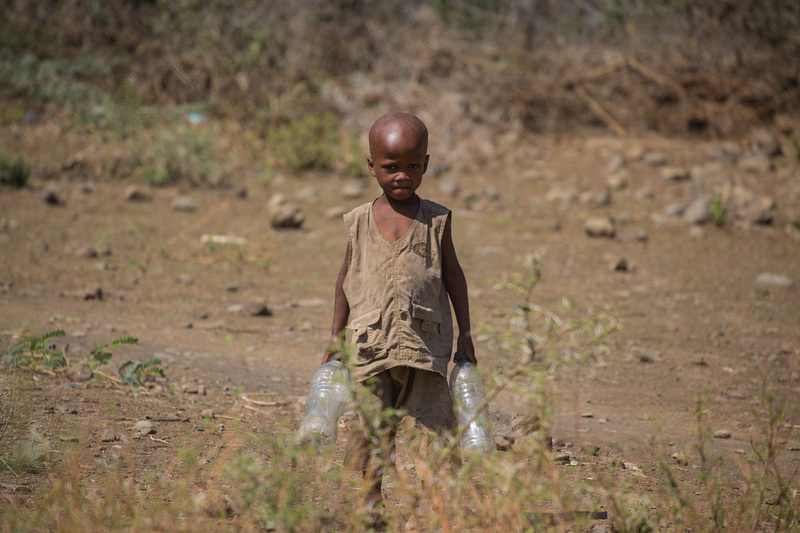 He had been sent by his parents to collect water from the bottom of the village. 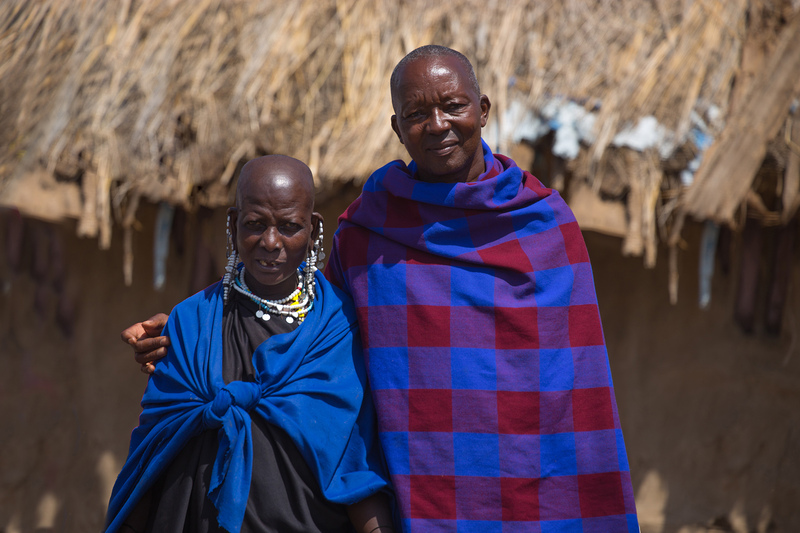 Like many Maasai, they were extremely adverse to have their photograph taken; they do not like it! His expression shows this rather too well. 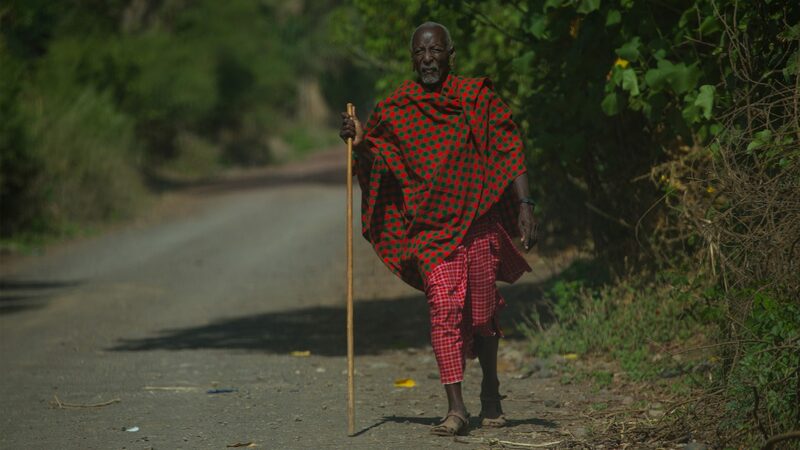 On the outskirts of Monduli village I captured the walk of a village elder as he approaches the outskirts. A most common sight during your travels, you’ll see all members of society walking. Even in the baking midday sun, its easy to understand why they’ve developed their distinctive clothing to suit their environment, as it seems to offer both protection against the sun and flamboyance and colour. Although it was rare to see a Maasai wearing a hat. Not far from the Baobob tree was a mother with three small children, again peering down, but their mother hurrying to “shoo” them away. 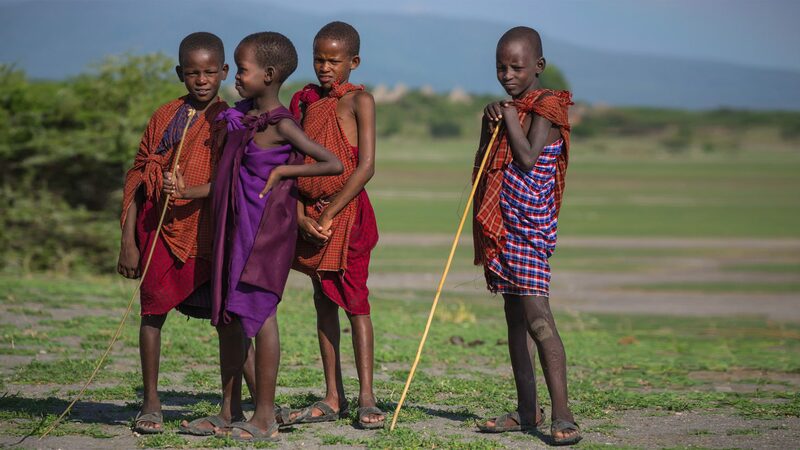 Unlike western children, Maasai girls and boys have shaved heads, for apparently hair is a sign of assertiveness – and warriors are the only members of the Maasai community to wear long hair, which they weave in thinly braided strands, dyed red with clay. During one of our drives deep inland, we stopped at a watering hole for a break. As each of us stepped out of the trucks for a welcome chance to stretch, I spotted this young Maasai spying on us from far away on top of thr hill looking down. 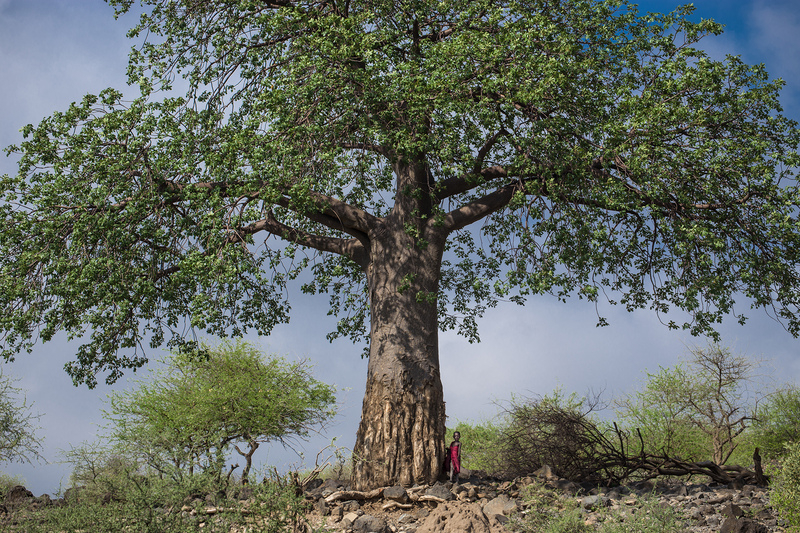 I’m not sure who was more curious, her or me, but I was grateful for the powerful zoom lens that I has attached to my camera, able to capture her inquisitive looks hiding beside a magnificant Baobab tree.